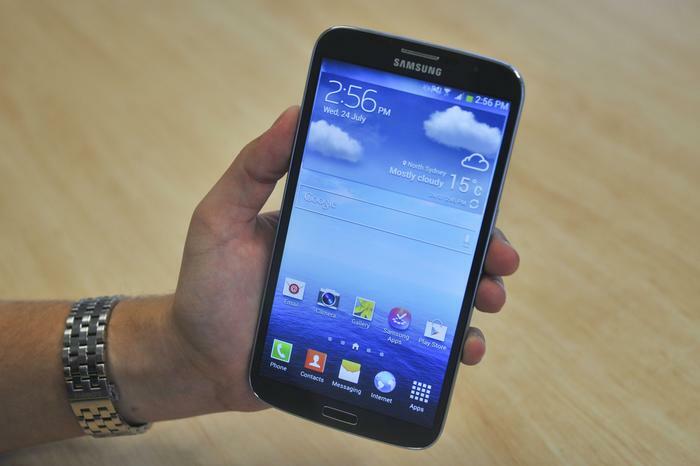 Smartphones with huge screens seem to be a growing trend in the market and Samsung is buying right into the hype. Its latest release is the ridiculous looking but appropriately named Galaxy Mega 6.3, a mid-range smartphone with a gigantic 6.3in touchscreen. It offers excellent battery life and 4G connectivity, but performance is a mixed bag. According to Samsung, the Galaxy Mega 6.3 is "a device that combines the portability and convenience of a smartphone with the power, multitasking capabilities and extensive viewing experience of a tablet." In other words, the company couldn't make up its mind whether the Galaxy Mega is a smartphone or a tablet but feels it's onto a winner with large screens. 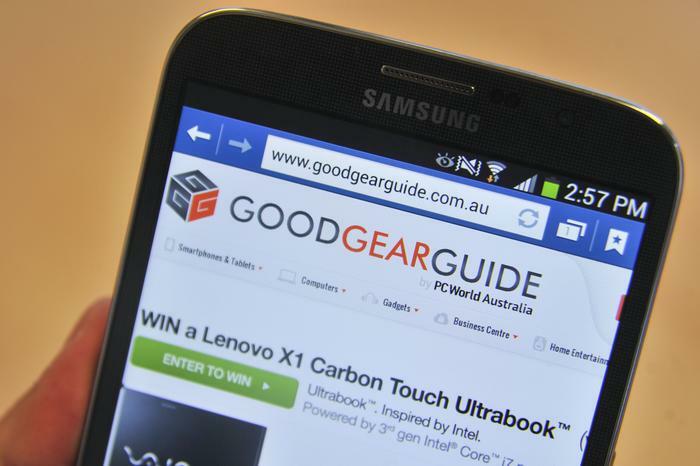 Who are we to argue with Samsung's profits? The Galaxy Mega 6.3 may be portable but make no mistake, it is absolutely huge. At 88mm wide and almost 198mm tall, this is the biggest smartphone we've ever reviewed, easily dwarfing the Galaxy Note II by some margin. It's also bigger than the 6.1in Huawei Ascend Mate, a phone that Huawei claimed had the "biggest screen in the world" back in February. The Galaxy Mega 6.3 weighs almost 200g, but it doesn't feel overly heavy in the hand considering its size. The large footprint of the Galaxy Mega 6.3 means it's very difficult to use single-handedly. We managed to hold the phone in one hand to read, and one handed-browsing is certainly possible, but most of the time you'll need to use two hands to operate it. While it's easy enough to access the right-mounted power/lock screen button and left-mounted volume rocker single-handedly, it's nearly impossible to reach the home, menu and back buttons below the screen. The sheer size of the Galaxy Mega 6.3 isn't at all helped by Samsung's now familiar glossy, plastic finish. While this design allows for a removable battery and a microSD card slot, it also makes the phone quite slippery to hold. It's basically an oversized Galaxy S4 and even comes in the same two colour variants, black and white. We do have to give Samsung some credit for the design, however, as the Galaxy Mega 6.3 is very svelte at just 8mm thin. The Galaxy Mega 6.3 might be mega in screen size, but it's not really mega in specifications. It's screen has a lower, 720p resolution of 1280x720 when compared with most current flagship smartphones. If you're coming from a device like the Galaxy S4 or the HTC One you'll immediately notice a difference, especially when viewing text. However, image quality remains bright, clear and vibrant overall and most users won't notice a significant difference. The Super Clear LCD also has excellent viewing angles and sunlight legibility is good, despite the fact that the glossy surface can be very reflective. 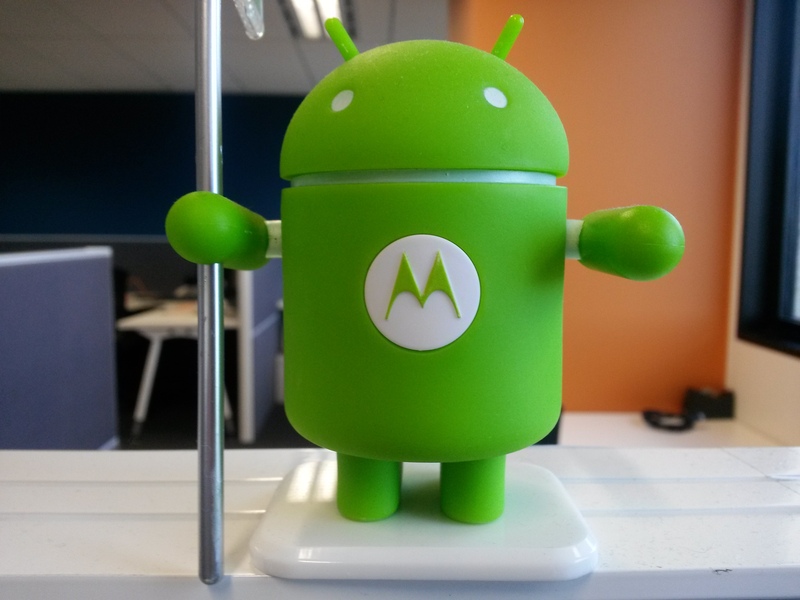 Using the Samsung Galaxy Mega 6.3 is a very similar experience to the Galaxy S4. Like that device, the Galaxy Mega 6.3 runs the latest Android 4.2 Jelly Bean operating system, and is skinned with Samsung's latest TouchWIZ UI overlay. The basic interface remains unchanged from the Galaxy S4. There are up to seven home screen for widgets and app shortcuts, handy toggles for commonly used features in the notifications panel, including a brightness slider, and the ability to hide apps in the app drawer or choose to display them in a grid or list format. 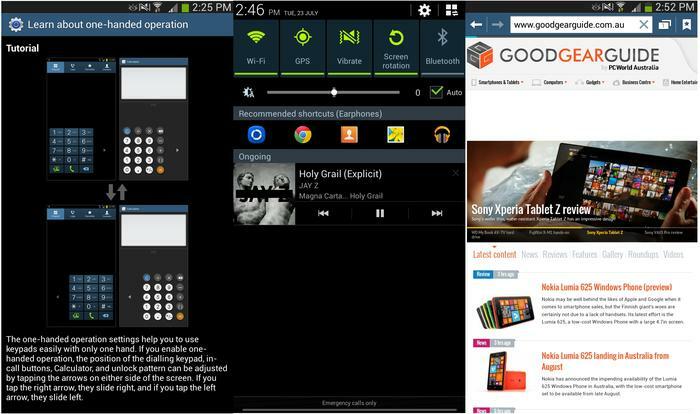 The Galaxy Mega 6.3 comes with the multi-window feature, which allows you to run two apps on the screen simultaneously. It only works with a selected range of apps but the likes of Google Chrome, Facebook, Gmail and Twitter are compatible. It's an excellent feature given the huge screen size. We also like the "one-handed operation" features, which position the dialer, the calculator and the unlock pattern towards the left or right of the screen. Smart Stay, which uses the phone's front facing camera to determine when you are looking at the screen, refusing to timeout in that case, and Air View, which allows you to hover over the screen with your finger to display extra information are also included on the Galaxy Mega 6.3. Neither feature adds much to the overall user experience. The Galaxy Mega 6.3 doesn't include a few of the S4's other software features like Smart Rotation, Smart Pause and Smart Scroll but they are mostly gimmicks that won't be missed. Thankfully, the built-in infrared port remains at the top of the phone that allows the Galaxy Mega 6.3 to act as a remote control for your TV and other home entertainment devices. There's also an S Translator app that can translate nine different languages using both text to speech and speech to text, and 'Group Play', which can send music photos and documents to multiple devices. The Galaxy Mega 6.3 is unfortunately a mixed bag in terms of performance. It is fast and smooth for most part and handles the latest graphically intense games, such as Real Racing 3, without any issues. However, basic tasks like swiping through home screens and scrolling through lists and Web pages aren't as slick as the best devices on the market. In this case, the Galaxy Mega 6.3's 1.5GB of RAM and 1.7GHz dual-core Snapdragon 400 processor don't perform as well as we hoped. However, if you haven't used one of this year's flagship Android phones, you aren't likely to notice this issue too much. The Samsung Galaxy Mega 6.3 has an 8-megapixel rear-facing camera and a front-facing 1.9-megapixel camera for video calls. The camera app is almost identical to the one used on the Galaxy S4 and we particularly like the excellent scrolling carousel to change camera modes. Photos captured are above average in quality. The Galaxy Mega 6.3 suffers from excessive image noise when shooting in low light, but photos in well lit areas have impressive levels of detail and good colour reproduction. The sheer size of the handset can make it hard to keep the phone steady when taking photos, so you'll need to take extra care to avoid blurry shots. The Galaxy Mega 6.3 has 10 camera modes but unlike many of the phone's other features, most of them actually add to the experience. Modes include HDR, panorama and the sound and shot mode that captures an image with up to nine seconds of sound. There's also a night mode, and a best photo mode that takes eight photos in quick succession to ensure you capture the best image. Absent from the Galaxy Mega 6.3's camera are drama shot, eraser mode, animated photo, and dual camera, all of which come with the Galaxy S4. Our GT-I9205 review model of the Galaxy Mega 6.3 came with 8GB of internal memory but Samsung also sells a 16GB model. 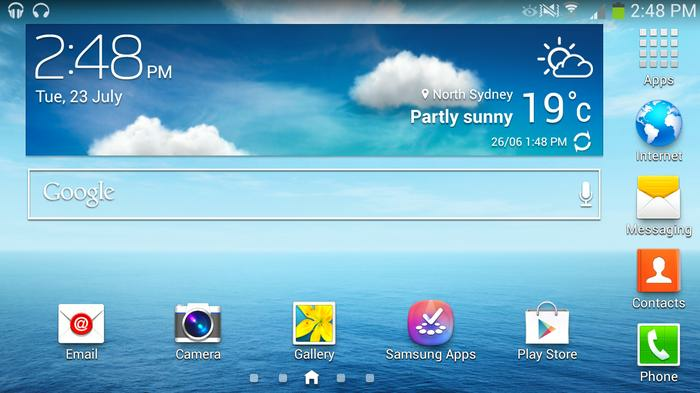 Our review unit supported the 1800MHz 4G network band used in Australia by Telstra, Optus and Vodafone but it remains to be seen whether Samsung will officially launch this device Down Under. The Galaxy Mega 6.3's 3200mAh battery is one of the strongest features of the phone. In our testing, the Mega 6.3 easily lasted a full day on most occasions, usually pushing close to 18 hours of use before requiring a recharge. Most users should easily be able to go a full day without charging, and less frequent use should see battery life push towards a day and a half. 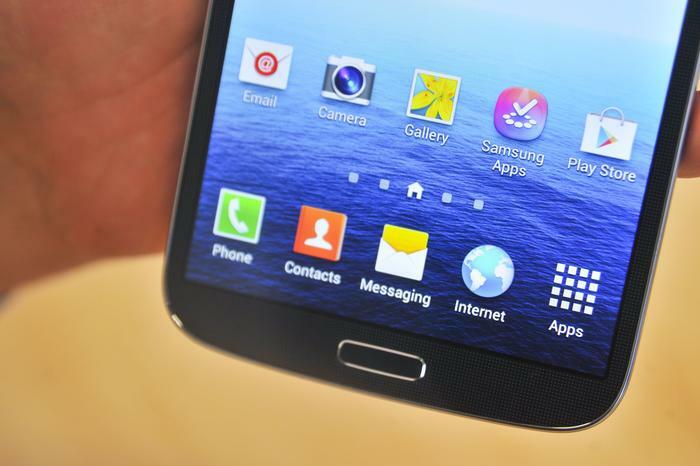 The Samsung Galaxy Mega 6.3 is a mid-range smartphone with a gigantic 6.3in touchscreen. It offers excellent battery life and 4G connectivity, but performance is a mixed bag and it's impossible to use single-handed.